Learn the three most common reasons golfers don't improve their golf swings in this golf instruction video from Chuck Quinton, RotarySwing.com Founder. Hi. I'm Chuck Quinton, founder of the Rotary Swing Tour online learning system. As the founder of the world's most advanced online golf swing learning system, I've had the opportunity to help hundreds of thousands of golfers improve their swings but that doesn't mean anything to you if you're one of those guys out there pounding balls on the range and not getting any better. The reality is, there are typically three really, really common reasons that golfers don't improve their golf swings. The first one I want to talk about is being right-side or left-side dominant in your golf swing. Now I'm going to assume for the next few minutes that you are probably right-handed and playing from the left side of the ball which means you use right-handed golf clubs. Playing golf from the left side of the ball means that you have to use your lead side or your left side to control the golf club. What I mean by that is, when you're pushing the club through ... If you've watched my videos on pushing versus pulling, you'll understand that the club is always wanting to rotate around its center of axis, or center of gravity, excuse me, whereas when you pull something, the force of movement, in this case the left side of the body, and the center of gravity of the clubface want to line up. Now that may sound complicated for a second but understand this. How many times have you ever seen somebody pushing a trailer down the highway? Never, right? How many times have you seen somebody pulling a trailer down the highway? Well that's how they all work. Why? Why don't you see somebody pushing the trailer? Well the reality is when you're pushing a trailer ... again, watch my push versus pull video ... If you're pushing a trailer, the two centers of gravity have got to line up perfectly. The center of gravity's infinitesimally small so to line those up ... if you've ever tried to back your trailer up the driveway trying to get it to fit in there perfectly, you understand what I'm talking about how much the trailer wants to rotate around this pivot point in which case the trailer hook, the ball on the trailer ... and so it's very difficult to do that. But if now you pull forward, the trailer, the two centers of gravity of the truck ... the force of movement is the truck's making the trailer move ... and the center of gravity of the trailer automatically line up because you're pulling them. Well why would golf defy the laws of physics? Anybody's that teaching you to push from the right side is trying to get you to push a trailer down the highway. You must align yourself with the laws of physics. You're not going to outsmart Newton on this. So the left side of the body has to pull the club into impact and that's what stabilizes the clubface. That may be the first time you've ever heard that before but at Rotary Swing we talk about physics a lot because you can't deny them. They're an incredible important part of the golf swing. So first, make sure you're aligning yourself with the laws of physics. Now the second reason that people typically don't improve is because they don't align themselves with the laws of how your brain actually learns a new movement pattern and that is really, really important because what most people do is they take a tip and they go out to the range and they try it a couple times and, "Hey. This kind of worked for me." They go out and play, it kind of worked. They come back the next day, they try that same tip, it doesn't work anymore. How come? Well we call that chopping wood, or swing thoughts that work only one day. If you want to stop chopping wood with your golf swing, you need to understand that your brain learns through a very specific mechanical pathway that's a biological, physiological change in your brain which means it really only understands one thing. If you want to learn something new, you have to keep repeating that movement pattern over and over and over again. In fact, again, if you watch some of my videos on how the brain learns new movement patterns on rotaryswing.com, you'll see that it takes between 100 and 300 reps to even learn a new movement pattern. So for you to actually start to truly learn something, you must do a minimum of a hundred to 300 repetitions in that one session. Now think about that. How many golf lessons have you taken over the years? Gazillions, right? And each time, how many times have you really, really gotten better and been able to stick with that change? Well if you're watching a video on YouTube you probably didn't get very far because you're still looking for more wood. You're trying to chop more wood. You're looking for me to give you some great swing thought that's going to help you all of a sudden achieve your golfing dreams. It doesn't work like that. You haven't learned anything in your life like that. You learn through repetition and so, again, RST five-step system we walk you through a very specific sequence of how to do these drills but also we require that you do the reps. You're not going to learn through osmosis. Me sitting here talking to you is not going to make you a better golfer. You have to get up and do the drills that I specify on the site to actually improve, and you've got to keep repeating them over and over again. It's a total of about 3,000 to 5,000 reps to overwrite an existing movement pattern that you have and master a new one. Now you've probably got a lot of bad existing movement patterns so you're going to take some work. You're not going to be able to just take one new swing thought and go out and play like Tiger Woods or Rory McIlroy the next day. That's completely ridiculous and unrealistic. You're going to take time to do the reps and keep doing them over and over again. Now, the last reason that people typically don't improve in their swings is it goes back to the chopping wood idea and that is because you're constantly searching for some new random tip. The golf swing is based on a few things. One, physics. I don't care who you are, nobody's ever outsmarted Newton. So the physics of what you're trying to do in your swing and the physics of the forces of the club that are actually working must be understood and abided by. You have to understand that you cannot overwrite the laws of physics and swing a different way. If you're pushing, you're always going to be throwing away lag. If you start spinning your shoulders really hard creating a lot of centripetal force early in the swing, you're going to create centrifugal force. It's going to cause the club to throw away. You can't do that. The second thing is that you must understand how the brain learns new movement patterns. That is critical. But in all of these things together, you really have to understand that you have to stick with something that works and makes sense. If you're constantly looking on TV or in a magazine and looking for another tip every single day, you will always be chasing your tail around. Nobody ever learns anything in life like this. It doesn't matter what it is. If you're learning how to play a musical instrument, you don't bounce from one instructor to the next to the next to the next hoping that they're going to give you something different. The great thing about learning a musical instrument is that everybody pretty much teaches the same way because they all agree that there are fundamentals that have to be abided by for you to learn how to play a musical instrument. Golf should not try and buck that trend. Rotary swing is all about teaching you these golf swing fundamentals that you have to abide by because they're based on science. They're not based on my personal opinion, or how this golfer swings, or that golfer swings. We don't care how the tour pros swing even though more tour pros use the rotary swing fundamentals than all of the other swing methodologies combined. So if you're serious about improving your game, stick with the system that you choose. Those are three things that you typically see why golfers don't improve. If you change your mindset about how you think through you're going to work on your golf swing and start following the system and work through the three things I just talked about, you will start to improve your golf swing. 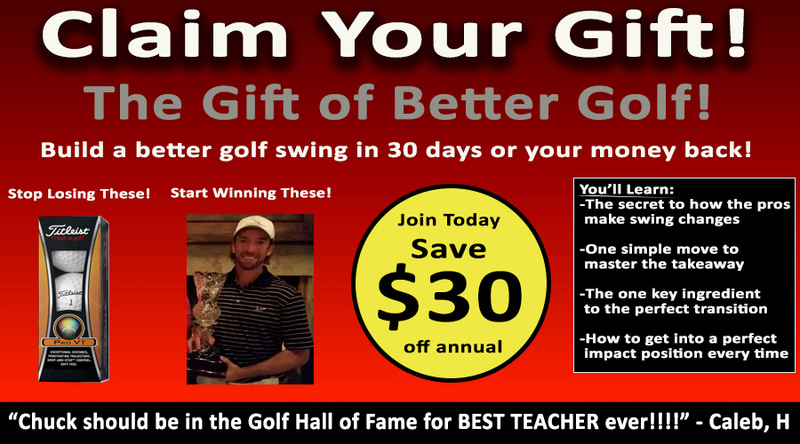 Get Your Free Membership to Finish Watching "The 3 Reasons You're Not Improving at Golf" Right Now!